The headlines will say that the market sold off today, but in reality the futures brought down the opening marks which were then bid up most of the day. Tech stocks briefly went green and small caps (IWM) closed in positive territory. The consensus opinion is that the market will rocket higher as soon as D.C. makes a deal, and I must have heard the phrase “buy the dip” 100 times today. There aren’t many bears out there. I was also amazed at how many people were talking about selling volatility, as if there will never be a VIX over 17 again, and these pundits claimed it was a terrific opportunity to sell vol as there is no real market risk. Someday these folks will learn the hard way that being blindly short volatility can have painful consequences, but it is anybody’s guess when that will be. A lot of today’s vol sellers haven’t seen the VIX really rip higher, it has become sort of a free lunch for them. The VIX futures did not respond commensurately to the rise of implied vol in the S&P puts, as October only rose 4.5%. Obviously, VIX futures holders expect vol to fall quickly, regardless of the debt ceiling battle immediately behind this one. Even more consensus opinions claim that it is good that D.C. is battling now, because the losing party will not put up much of a fight in the debt ceiling deal. Clearly, nobody expects anything bad to happen, in the media anyway. I am a bit more cautious and can wait to sell vol when either these things get cleared up or the price for vol goes high enough to compensate for risk. 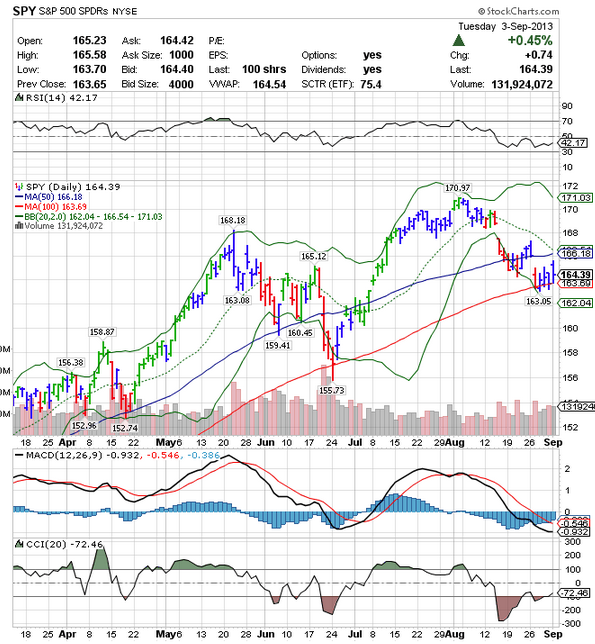 The momentum stocks, small caps and tech stocks have not corrected in the slightest bit, and that means that vol is too low for me to sell it now. Sure we could rip higher if some deal occurs, but you can sell vol for days after a vol exhale, you don’t necessarily have to put yourself out there being early. 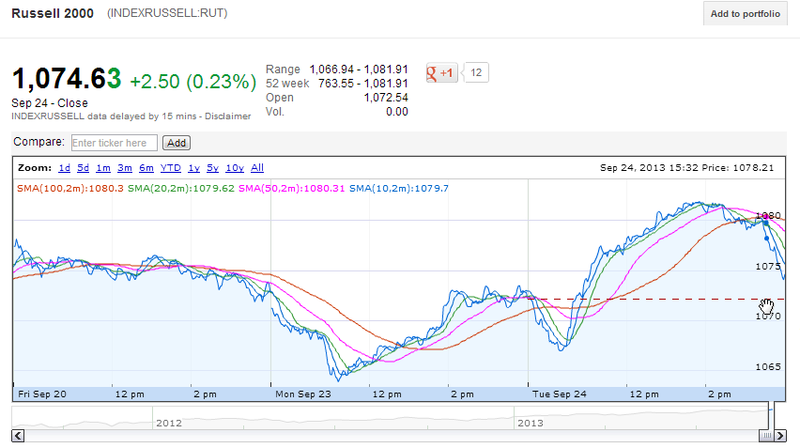 Today was a great day, as I came in short Russell 2k and Nasdaq futures and covered them up early in the day. i was also short crude and covered that also. At the end of the day, when the almost traditional end of day spike arrived, I reshorted both, but this time my stops are quite tight due to the potential for some kind of resolution in D.C. Seems to me that people are way too bullish and complacent right now. 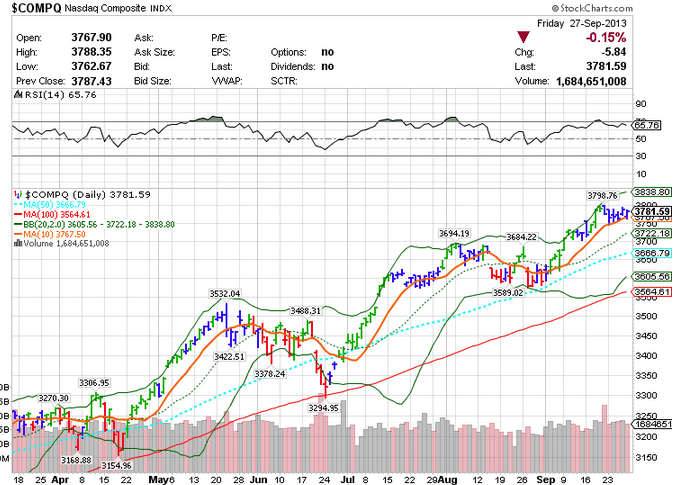 I will get long if the market tells me too, but I am currently more cautious than the crowd. There may be a much better opportunity to sell VXX and VIX call spreads in the weeks ahead, or maybe just get short VXX or UVXY. I will wait a bit and see what happens. What was different about today that changed the volatility landscape? The S&P fell 7 points, but it has done that for 5 out of 6 days on low volume with the VIX turning a blind eye to all prior dips. The Nasdaq and Russell 2000 barely fell, and are right near their highs. It appears that the beta race by underperforming managers is on, and they will use the momentum names and small caps to desperately catch up. Could this mean a big push into the end of the year? Quite possibly. But the street seems to know the future already, with everybody claiming the market will be bought at the infamous 50 day moving average. So they can see everything so clearly, a mild pullback as they wait for DC to inevitably compromise, then higher. When everybody is thinking the same thing, it makes me consider the alternatives, like the possibility of something unexpected. 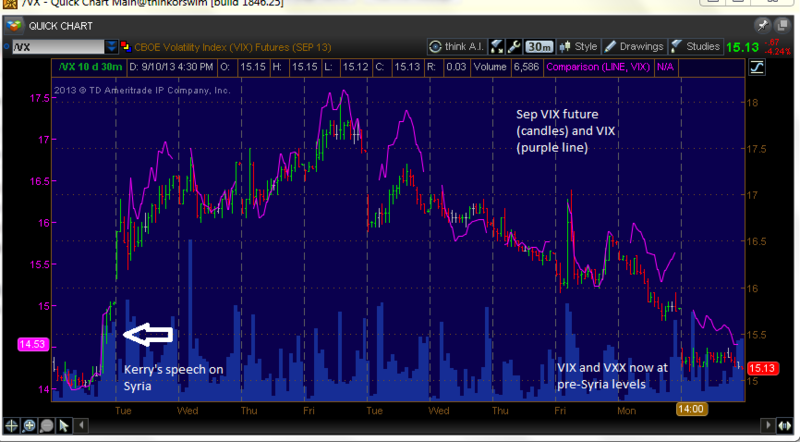 The futures rose, and with over two weeks to expiration met spot VIX. 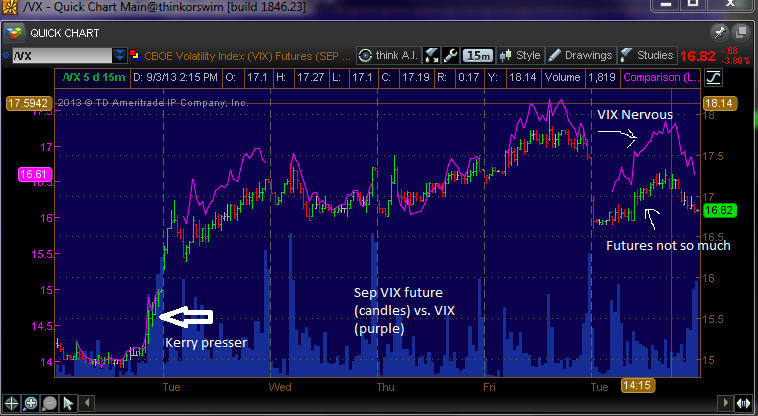 In fact, the spot VIX was higher than the October future for part of the day. This is unusual, as the time premium usually has the future trading higher than spot VIX. Furthermore, the weekend sees spot VIX fall anticipating weekend decay in the options. So, while the VIX level is not high buy any means, it is starting to respect the potential for shenanigans in DC. This was one of those days where new and uninformed VXX traders sit confused wondering why the VXX was not up 10%. At this point, the VXX is holding about 40% of the more expensive November future, and this will impede a move higher. The futures are not convinced of any real blow up in DC, but why should they be? Real volatility is a distant memory and a lot of folks have made bundles shorting vol. One of these days, this will burn a ton of people. I closed the remaining Oct VIX $14 calls I had for 1.70, which was a nice return from $1.35 and $1.40. It obviously is too early to sell volatility here. I would be much more inclined to begin selling vol over 17. I have been short Russell 2000 futures for a couple days and I added a small short Nasdaq futures position as well. I will not fight these, and I will get stopped out on any move higher, period. This is confusing, I must admit. I closed some October VIX $14 calls for a small profit at $1.55, ($1.35 and $1.40 entry) as I am not going to accept a vol exhale should something positive occur in DC over the weekend. I would much rather sell volatility instead of waiting for it to arrive, and I have seen enough to consider that it is possible it may not show up. No sense hoping, there will always be other opportunities, and selling vol is easier anyway. 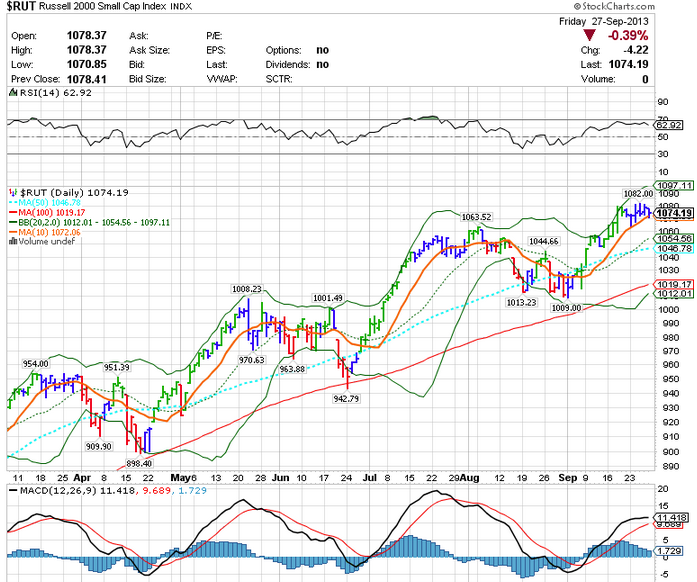 The MACD is about to give a sell signal on the S&P, yet the NYMO has retreated to neutral levels. The Russell made an all-time intraday high today, and that signals to me that there could be a lot of folks out there chasing beta due to under-performance. Regardless of the technicals, the market itself is still very vulnerable to a surprise. The abundance of put selling in the SPY is something to watch. If the market falls, the delta hedge is selling the index, so it can sort of feed on itself. True to form, Mr. Bernanke did it again. With zero change in policy, markets rallied and volatility evaporated, consistent with the typical volatility exhale that occurs after he’s taken the stage before. The difference this time was that markets were near the highs and volatility was already low, so the futures could only fall so far. The VIX settled at 14.77 at the open today, which enabled us to profit from the 14/15 VIX calls spreads put on at .57. Not surprisingly, the 14.77 mark was the high of the day as out of the money puts were bid at the open, allowing almost the maximum pain for VIX put and call holders. With a stalemate in DC and government shutdown looming, followed closely behind by the debt ceiling, it is not all roses for bulls going forward. It is probably a nice time to be adding/initiating vol positions for what will overtake the newswires in the weeks ahead. The VIX 13 and 14 calls are looking attractive. Believe me, I would prefer selling vol or shorting VXX in some way, but now is not the time. I sold the Dec S&P mini future contract at 1720.5, which is 50x the index. 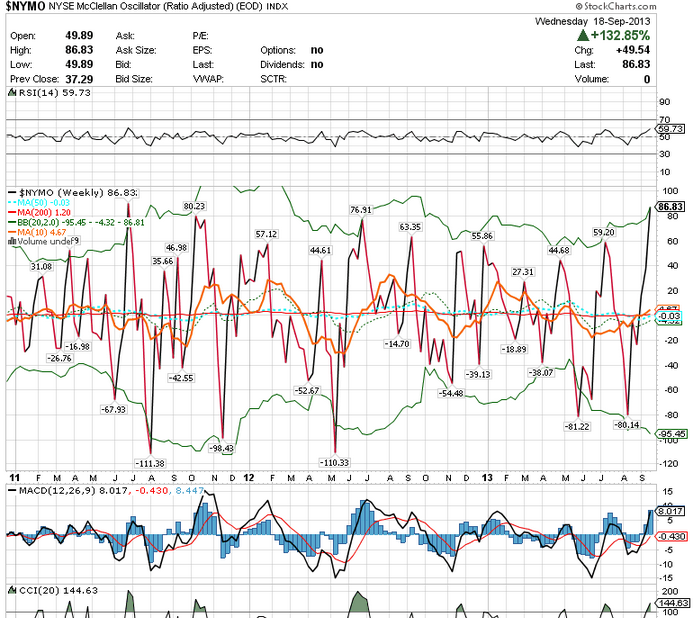 And I am long the VIX Oct 14 at 2.00, and I will add at around 1.30. I can not recall a Fed meeting in recent times with so much complacency. The VIX has not risen in anticipation of potential volatility, and markets enter the uncertain announcement with bravado, near all-time highs. Sentiment is very bullish, where folks seem to expect positive results if the Fed tapers in the expected range, or if they don’t taper at all. In either scenario, higher prices are expected. This market behavior should at the least get your attention to some potential downside. While it can certainly go higher, it can also surprise. Markets are challenged historically after mid-September until November, higher volatility may occur due to an impending budget and debt ceiling battle, and the S&P is extended and overbought signals are showing up in the NYMO and breadth indicators. Typically, you would see an elevated level of volatility and a volatility exhale as the market receives the news. If that is the case, and it certainly doesn’t look like the markets are concerned in the least bit, then I suppose it is possible for October’s future could fall below 15. That is only a 3% drop to 15. With the VXX holding all Oct as of tomorrow, then the downside to the VXX is relatively limited. But it also means that if there is a surprise, the VXX can shoot up quickly, since is not holding more expensive November futures yet. That leaves us with little to do in the vol space. Tomorrow will be all about the reaction and trading that. 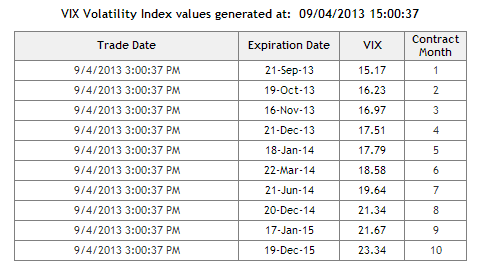 If vol falls significantly, I want to add to the VIX $14 calls, because there will be volatility in the near future. I am still also long the Sep spreads, which will break even if the opening VIX print tomorrow is around where it is now. The volatility I expected to even mildly enter the market never materialized, but as I sold the 15 and 16’s, the downside was minimal. While I am now long VIX call spreads into the Fed meeting, I also tweeted out that I started an Oct $14 VIX call position for $2.20. Logic would dictate that even though folks keep claiming that the Fed decision is baked in, I think there are many reasons why volatility could rise from here as October approaches and gets underway. Expiration in this opex cycle is day 19, and you can see what historically happens with vol from that point. October can be a very bumpy month as it was last year. Thirdly, I’m having a hard time understanding what is “baked-in” to the stock market in regard to the Fed decision. It is near the highs of the year. So one can reasonably expect folks to put on some protection next week heading into it. If we get a mild bump in vol, our spreads will work to perfection. Interestingly, the calls expire the morning of the Fed decision, so the post-meeting volatility exhale I commonly refer too will not be a factor in the settlement of these options. Sure there are expectations for what the Fed will do, but that is not reality yet, thus there is some uncertainty. I suppose that the VIX could sit at or below 14 heading into the meeting, but that is unlikely. I’ve already heard many folks expecting a rally immediately after the Fed decision, now that it will be out of the way. Ok, if that is the consensus heading into the meeting, that makes a downside move even more possible. Furthermore, opex week is next week, and that makes volatility unpredictable. Like the chart indicates above, historically the volatility in September comes the week after opex, but you can’t make that assumption during an opex week. The VXX is no bargain though. It is now 85% comprised of October at 15.80. You saw what that means today when the VIX rose, the VXX barely budged as the VXX is essentially holding 1.50 of premium to spot VIX. This is a drag on the VXX when volatility goes higher, essentially impeding its rise. The Oct options give you more leverage to a move in the VIX. It will be an interesting few days to say the least. VIX/VXX Fall to Pre-Syria Levels – Time To Get Long Volatility? 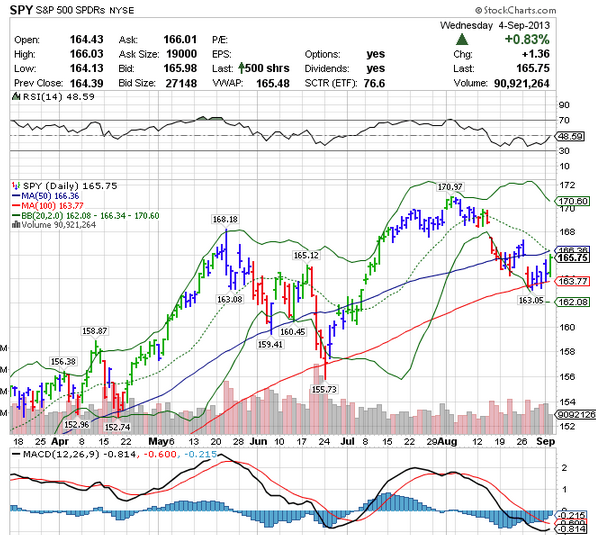 50 S&P points higher in 6 trading days is not bad for a September with so many looming issues to be resolved. The Fed meeting and taper-talk have receded in lieu of other news, and DC has been consumed with Syria, as opposed to dealing with the Federal budget that expires on Sep 30th, and a debt ceiling that will hit in mid-October. 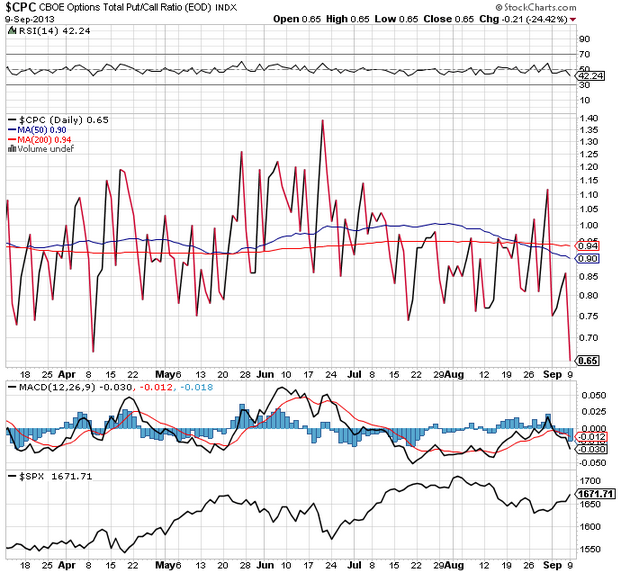 The total and index put/call ratio is very low, indicating that investors are not anticipating much market volatility. This is just one of a series of indicators, it is not a full-proof indicator by any means, but it should be noticed. 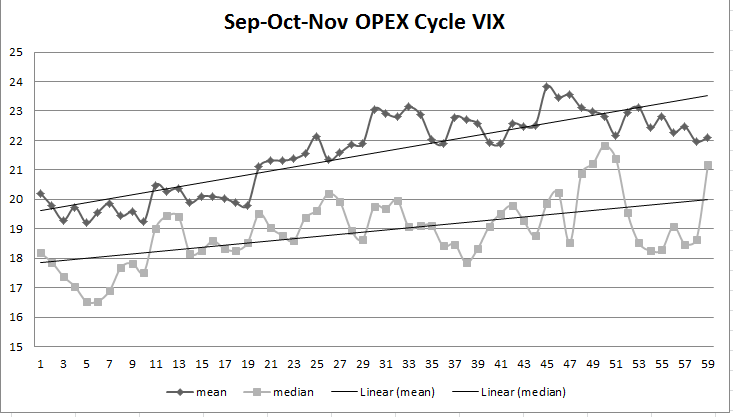 OPEX week is approaching and while history suggests that the middle of Sep is good for markets, the end of Sep is not. The beauty of this trade is that these calls will settle the morning of the announcement. 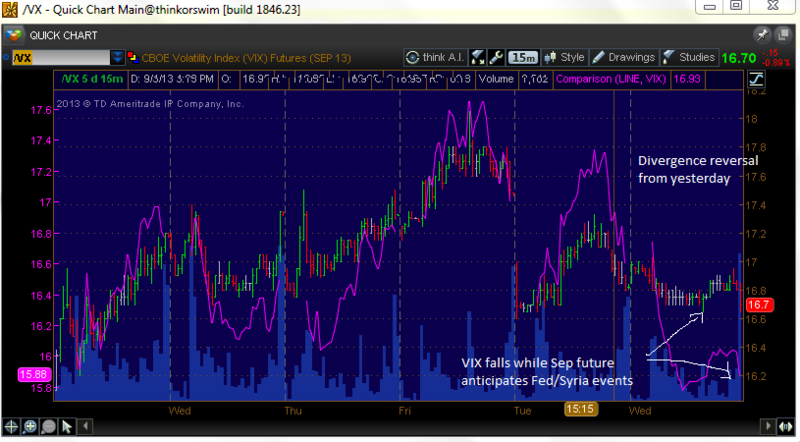 So barring an unforeseen leak of the Fed decision, volatility should rise and hold up into these calls being settled. If the VIX continues to fall toward 14 this week, I may add October naked calls, in anticipation of some volatility at the end of the month. I am eyeing the $14 and $15 calls. Another option is to sell VIX October put spreads. You could sell the $15/13 put spread for .65, and if the VIX is 15 at expiration, you collect the whole .65. If the VIX spikes, the position can be closed for a profit. VIX and VIX Futures Diverge – How Vulnerable is the VXX? Today had the feel of one of those days where shorts were stuck and there would be no way out. 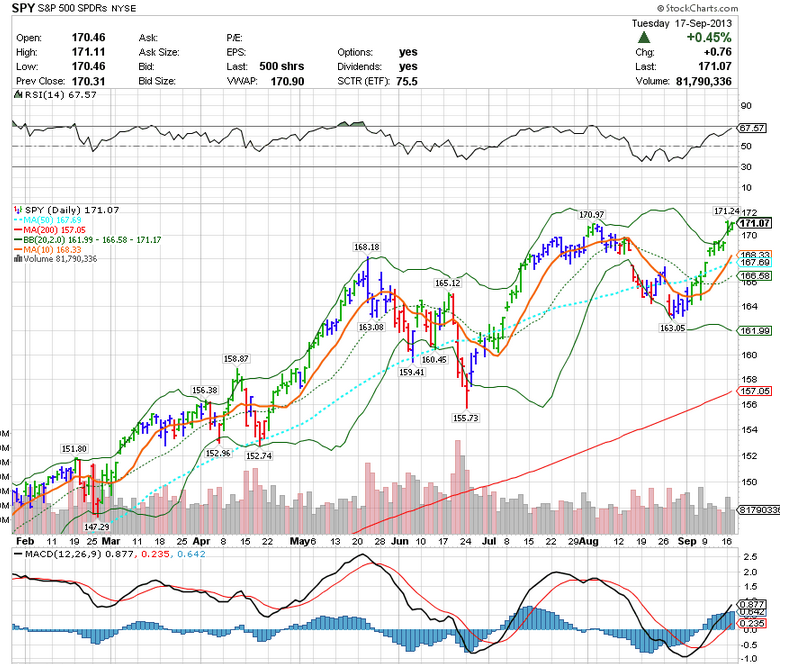 The SPY held the 100 day moving average to the decimal yesterday, and now it resides 21 points higher 25 hours later. Volume was quite low, the lowest since August 26th. Volatility fell, and is diverging from the futures, which means that the VXX was nearly flat as the VIX fell 4.4%. This is not rare, but it is interesting with the event risk that is present. Which will be correct, the futures or the options? But as VIX expiration approaches on the 18th, the VIX and the Sep future will have to converge. In the VXX’s case, the longer it can roll into October by selling an inflated September, the better it will hold up. This situation is better played through the Sep future itself, and the call spreads I mentioned yesterday are nice way to catch the decay into expiration. This is a terrific way to play the the event risk in multiple ways. For $1 you can sell either the $17 or $18 call in Sep and own October. If the VIX rises to 17 at expiration, that would essentially be a 2x or more return. If you let the Sep expire and hold October, you could take a bearish stance on the next debt debacle, or market seasonality being tough and let it ride. If volatility rises moderately, falls, or remains flat, this trade will work. What looks interesting to me is a unique opportunity to be long volatility going into the Fed event, but also be short volatility for a post-Fed exhale after the Sep 18th press conference. Because the VIX futures expire the day of the event, you get a shot to be long vol without the event risk and also hold options that are short vol right after the event. I’m looking at two scenarios. Since the FED meeting is the day the futures settle on Wednesday the 18th, you can buy a call spread and sell some premium in the outer leg, with the idea that the VIX will not fall before the meeting and you can collect the width of the spread. The $15-17 spread will run about $.90 and if the VIX remains above 17 on Wednesday morning the 18th, you collect $2. Losses begin at $15.90 VIX at settlement. There are a bunch of combinations here, selling put spreads, widening the call spread, but the idea is the same. You are looking to use the event to expect an elevated risk level. I suppose that Hilsenrath can drop a tape bomb, but this is a delicate meeting and that seems doubtful. Furthermore, you have a host of other events brewing that should hold the VIX up. 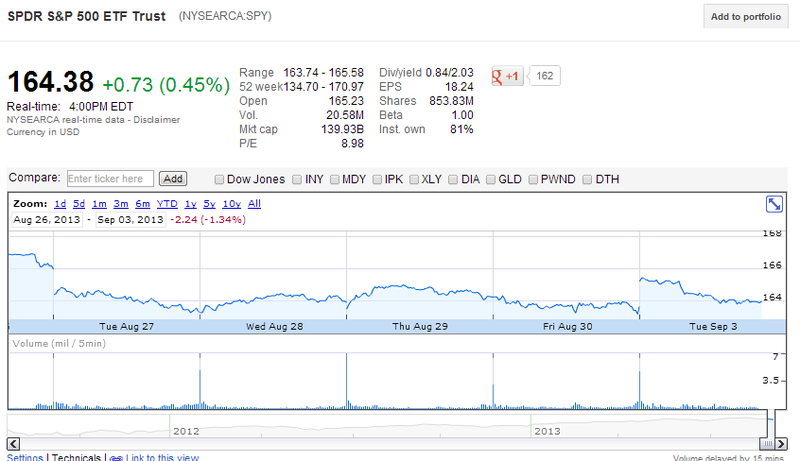 Sell the Sep 13th $16 put and buy the Sep 20th put for a net debit of around .27. If the VXX sits tight or drifts to $16 on Sep 13th, then you get a free runner for a volatility exhale after the Fed meeting. By then, the Syria situation could be clearer as well. If this trade works out perfectly, it could be a four bagger as the VXX heads to $15. You also can take it off next Friday if you so choose. The VXX is holding nearly 50% of Sep and Oct as of tomorrow.